My mom always loved roses. I remember when I was growing up, Dad used to stop on his way home from working in the woods to pick her bouquets of yellow roses from the bush that was climbing up the side of an old deserted barn. Whenever I see a yellow rose now, I always think of her. I have always talked about drawing some in Mom's memory. It just seemed right that they should be climbing roses... on the side of an old barn. I decided to use one of the pictures I took of an old barn just south of Anacortes, WA, for my backdrop. 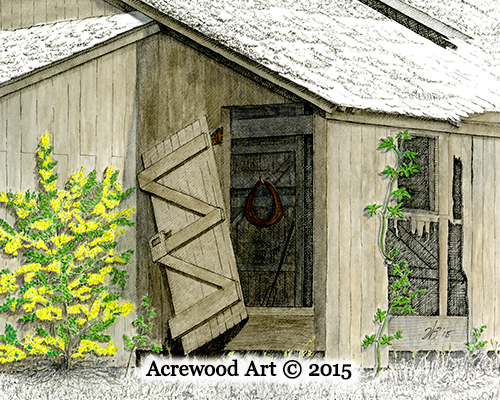 I chose a photo showing an open door that allows us to see the interior of the barn and what might be inside. This is a different view of the same barn I used for The Old Tulip Barn.